In the Harbour area the Great Northern Diver and Black-necked Grebe continued their long stay and there was also a Red-throated Diver and a Velvet Scoter. In South Bay there were 2 Long-tailed Ducks and 2 Common Scoter and in North Bay near the Albert Café the Stonechat and Black Redstart were seen again. Johnson’s Marsh had 80 Wigeon and 2 Teal, the Open Air Theatre continued to host a Kingfisher and 2 Water Rails and at Scalby Mills the juvenile Glaucous Gull was seen late in the afternoon, also there was a Ringed Plover and a Mediterranean Gull flew south. At Willerby Carr (about ¼ mile NE of the crossing) there was a good selection of wildfowl including c25 Whooper Swans, 10+ Pink-footed Geese, a White-fronted Goose and 5+ Tundra Bean Goose and in the Star/Seamer Carr area 19 White-fronted Geese, Little Egret, c100 Lapwing, 2 Redshank, 2 Snipe, Green Sandpiper and 10 Bean Geese flew SW.
7 Waxwings were seen flying low to the north over the junction Londesborough Road and St. James Road towards the Tap and Spile on Falsgrave. 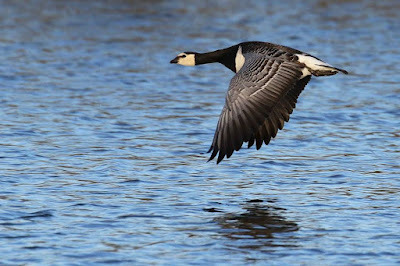 Elsewhere the Barnacle Goose was still with the Canada Geese at Seamer Tip pool with a Merlin and Buzzard also seen there, 5 Mediterranean Gulls at Holbeck, 30 Pink-footed Geese flying around fields by the A64 bypass, 2 Goosanders at Harwood Dale Lake, 6 Mandarin Duck on Hackness Lake, c50 Fieldfares at Hutton Buscel, there were 2265 Starlings seen going to roost in Old Town and at dusk c200 Rooks were seen moving north over the town.